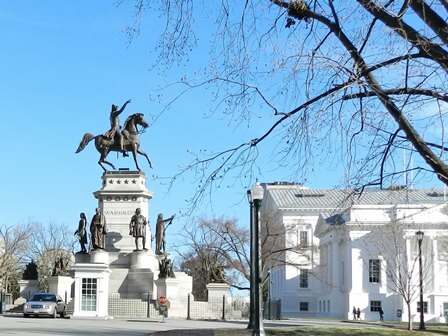 Linda Burton posting from Richmond, Virginia – If you want to know what George Washington really looked like, go to the Virginia state capitol. Centered in the rotunda against the simplicity of a formal backdrop of black and white stands a life-size statue of Washington, considered by his contemporaries to be “a perfect likeness.” It was June 1784 when the Virginia General Assembly commissioned the statue to be made; Thomas Jefferson, on a diplomatic mission in France, secured the services of French artist Jean-Antoine Houdon for the work. Houdon didn’t guess at his task; in the fall of 1785 he traveled to Mount Vernon to study his subject. He made a plaster mask of Washington’s head and took detailed measurements of his body; from this he modeled a terra cotta bust to take back to his workshop in France. The resulting statue, carved of Carrara marble, was shipped to America in 1796 and has graced the capitol’s rotunda since. 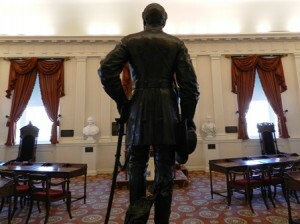 It is considered to be Virginia’s greatest treasure and one of the world’s finest portrait sculptures; it is the only full-length statue for which the first President posed. 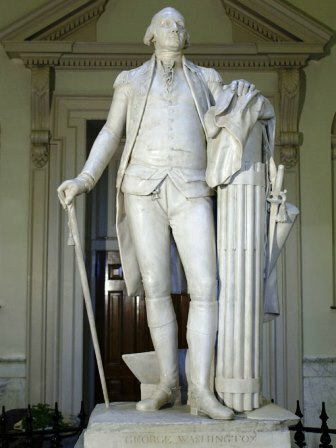 Although Washington’s sword is by his side and he wears his Revolutionary uniform, he carries a civilian walking cane and stands over a plough; Houdon sought to show the balance between Washington’s life as a soldier, statesman, and private citizen. 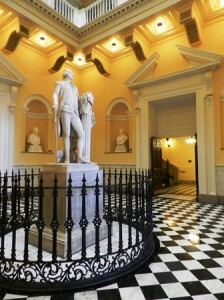 In the niches of the rotunda are busts of other Virginia-born presidents who succeeded Washington – Jefferson, Madison, Monroe, Harrison, Tyler, Taylor, and Wilson – and another work by Houdon; that of LaFayette, the French citizen who was a Major General in service to the United States during the Revolutionary War. But more about the rotunda itself, a magnificent two-story space capped by a dome; a dome that is invisible from the outside. That’s right; the dome is constructed beneath the pitch of the building’s gable roof. Thomas Jefferson, Minister to France at the time he was charged with the responsibility of overseeing the design for a building that would “unite economy with elegance,” thought the Maison Carree, a Roman temple built in Nimes, France, to be both beautiful and “noble beyond expression.” He chose it as the primary model for Virginia’s capitol; the cornerstone was laid August 18, 1785. This “temple on the hill” is believed to be the modern world’s first major public building designed as a Classical Roman temple. In continuous use since 1788, it is recognized as an internationally significant landmark and continues to impact the design of schools, libraries, courthouses, and churches across the country. Classical Roman temples are not topped by domes, as you know, but Jefferson envisioned the central room in the capitol as an impressive setting for the Washington statue that was being sculpted. 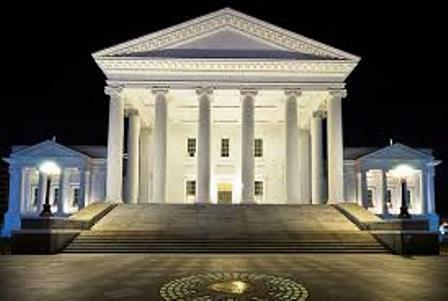 If you look at a sectional drawing of the building you can see how it works; the rotunda wound up being a two-story space capped by a dome underneath the building’s roof, illuminated by skylights and visually stunning; outside, the building’s lines retain the simplicity of Classical design. The original building was two-stories with a basement; although configurations for the use of space have changed over the years, and two flanking wings were added between 1904 and 1906, this building has been in continuous use since 1788. It is the second-oldest statehouse in the country (Maryland’s was completed in 1779); inside its walls many historical events have taken place. It was here that the House and Senate voted in 1791 to ratify the proposed US Bill of Rights, the first ten amendments to the US Constitution. Aaron Burr was convicted of treason in this building in 1807, in a Federal Circuit Court trial. 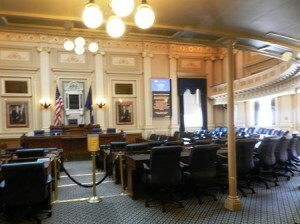 The Convention that drafted the Virginia Constitution of 1830 met here; as did the Virginia Secession Convention of 1861. 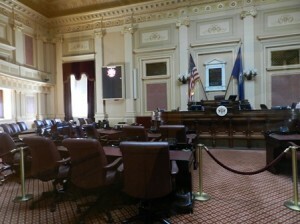 The Provisional Confederate Congress used the old Hall of the House of Delegates during the first summer of the Civil War; the old Senate Chamber was used by the Confederate House of Representatives from 1862 until 1865. Those two rooms are museums now, housing many statuary and historical objects. A full-length bronze of Robert E Lee stands in the Old Hall, erected where he stood on April 23, 1861, when he accepted command of the military forces of the Commonwealth of Virginia. This building continues to house the Virginia Assembly, the oldest continuous English-speaking lawmaking body in the New World, which met in churches, homes, taverns, hotels, and several different statehouses before this capitol was built. The 40 state senators now meet in chambers in the west wing that was added in the early 1900’s; over the podium hangs the marble “Signers Tablet” commemorating the seven Virginians who signed the Declaration of Independence. The 100 state delegates meet in the east wing (since 1906); on the north wall is a marble tablet honoring the Virginia Declaration of Rights, drafted by George Mason in 1776. Annual sessions of the General Assembly are held in even-numbered years for 60 days and in odd-numbered years for 30 days. Although much of downtown Richmond burned in April 1865 as it fell to Union forces, the capitol and the governor’s mansion were not damaged; all of Capitol Square remained intact. 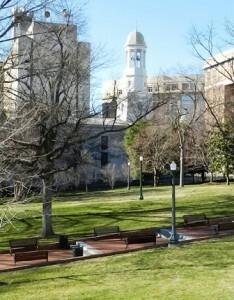 The public area around the capitol was a weed-filled, treeless open square when the Assembly decided it should be turned into a formal park in 1816. By 1818 the beautifully landscaped grounds were enclosed by an iron fence, and meandering walkways and native trees and shrubs gave it the appeal it retains today. Springs were channeled to two fountains placed in the southeast and southwest corners; the fountains still exist but now are fed by the city water supply. 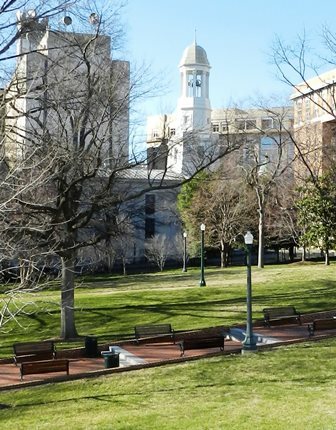 The Bell Tower was built in 1824; then it served as headquarters for the Virginia Public Guard; today is the office for the Capitol Square Preservation Council; visitor information is available here and the bell is still tolled each day. 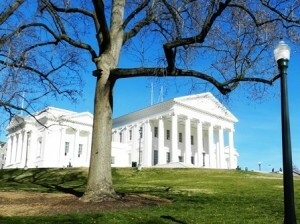 A number of impressive buildings surround the capitol, including the Executive Mansion, the oldest governor’s residence in continuous use (since 1813). And a number of statues dot the landscape within the Square – Edgar Allan Poe, who grew up in Richmond; Stonewall Jackson; Dr Hunter Holmes McGuire, a respected southern surgeon; Harry F Byrd, former Virginia governor and US Senator. At the main entrance to the Square is a collection of six statues inscribed with themes reflecting each patriot’s contribution – Andrew Lewis, Colonial Times; Patrick Henry, Revolution; George Mason, Bill of Rights; Thomas Jefferson, Independence; Thomas Nelson, Finance; and John Marshall, Justice. In the center, an equestrian statue sits high on a granite monument; it is George Washington atop his horse. 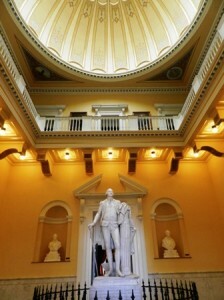 To his left stands the capitol, simple and sophisticated; another Washington statue centered inside.